Many people like to gather after work with friends and neighbors in the gardens in front of the apartment buildings they live in. So using this meetings Ariana launched a game with value added. The summer promotion targeted the people that like to gather with friends and neighbors and drink beer in the gardens in front of the apartment buildings they live in. But the campaign was upgraded – its main purpose was repairing the green zones and the gardens in front of the apartment buildings. The face of the campaign was the actor Nencho Balabanov who imitated the Bulgarian prime minister Boyko Borisov. 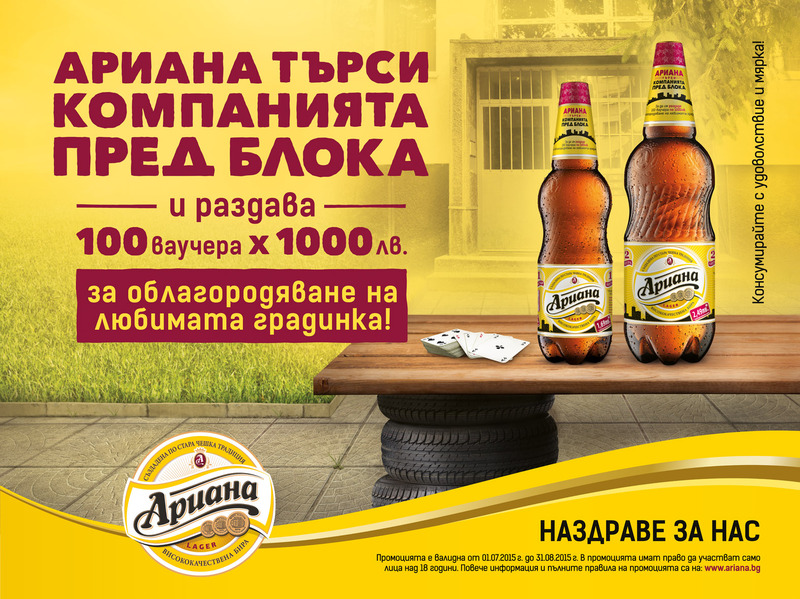 Sending 25 promo labels from 1-liter or 2-litres Ariana bottle every participant in the game got a chance to win one of 100 vouchers worth 1000 leva each for repairing the green zone in front of their building. The second stage of the game would choose the best 10 of them with an award of half-year free delivery of Ariana.